Lighthouses have been used as aids to maritime navigation for centuries. They are highly recognisable and beloved features of our coastline and waterways, treasured by communities and captivating visitors. But how many are there and is it really possible to visit them all? 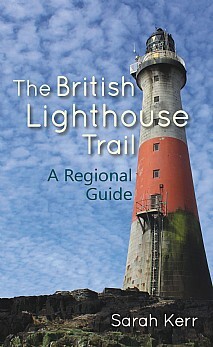 The British Lighthouse Trail is the only book of its kind to provide a comprehensive listing of all lighthouses in Scotland, England, Wales, Northern Ireland, the Isle of Man and Channel Islands accompanied by practical advice on how to reach them. The author, an avid pharologist, set off on a quest in 2012 to visit all lighthouses around the British coastline only to find that there were many more lighthouses to be discovered. This comprehensive book is the result of further extensive research and significant travel. Over 600 lighthouses are featured – from the perilous beauty of Shetland’s Muckle Flugga Lighthouse to the elegant serenity of Jersey’s Corbière Lighthouse. Complete with helpful maps highlighting the location of every lighthouse in each region and colour photography of a broad selection of our nation’s most weird and wonderful aids to navigation throughout, this book is an indispensable guide to visiting and seeing some of our nation’s most majestic, historical and isolated buildings. Each listing features a description of the structure, its light characteristic as well as any notable designers. Access information offers the best ways to reach or see each lighthouse, and whether it is possible to explore inside the tower. Nearby or related places of interest, such as other notable aids to navigation and relocated lighthouse optics, are also included. Experience the secluded joy of visiting tidal islands, watch waves lapping against some of the most remote rock structures, and feel the magic of walking in the footsteps of the lighthouse keepers inside the towers. This book will guide you on countless journeys never to be forgotten. This is the perfect companion for lighthouse enthusiasts, lovers of the great British outdoors and anyone interested in maritime history.